Secrets. Transformations. Crossing the Stargate. Venture into the new science and spirituality with the Stargate Mystery School. BLUE APPLES are an astounding supernatural power and the key to humanitys spiritual liberation. Myths of their existence contain codes to open our understanding of the deeper depths of consciousness. Joshua, Moses, Nimrod, Mari, Nebuchadnezzar, Jesus and all the alchemists of old put on the Cloak of the Illuminati and became Mighty Men who performed miracles and offered keys to the stargate. Some entered the stargate. How did they do it? They knew the secret of the Blue Apples. For over 5000 years the Blue Apples have been invested with amazing powers. Sumerian myth maintains the Anunnaki came to Earth from Planet X to retrieve them. Our bodies were manufactured to mine them (along with gold). The Blue Apples transform one into an El or Shining One, an Illuminati. Their secrets were sealed long ago. Now, the Anunnaki are returning to our world and so is their astonishing technology. So too are the spiritual teachings of the Blue Apples. the mystery and intrigue of the Blue Apples including their secret role in the story of JacobÕs Ladder, MosesÕ burning bush and the crucifixion of Jesus. their relation to the Cloak of the Illuminati, the stargate cloak of life. how to create a connection between you and the Blue Apples. the connection between Planet X, the Blue Apples and stargates. All the threads in quest lead to Rennes-le-Chateau, a French hilltop village with a history filled with conspiracy, intrigue and stories of a sealed secret, the secret of the Blue Apples. 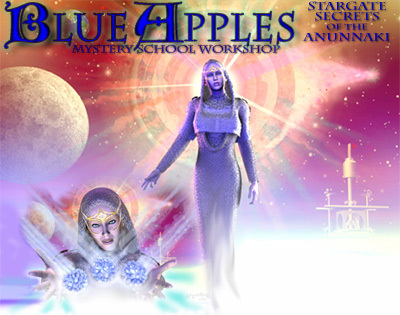 Prepare yourself to join the Stargate Mystery School for the journey of a lifetime in search of the secrets of the Blue Apples in France. Thousands of years ago the stargate technology of the gods was lost. Mayan Prophecy says it will return by 2012, along with our alignment with the center of our galaxy. This will bring the birth of a new matrix and a new human. We are its elders. Spend a day with author William Henry, creator of this highly original workshop, and special guest researcher, James Arthur, as we engage in a variety of exercises that aim to connect you to the inner truths of who we really are.